Phở Hòa is the Truth. It does phở and only phở. If you want spring rolls, you’re out of luck. If you want bánh mì or bún, you’d best look elsewhere. Phở Hòa is not one of those places where you can bring your xenophobic friends and expect them to find something that does not involve beef, noodles and broth. It’s a problem we have in this country—the odd notion that having something for everyone is more important than doing one thing really well. Whereas European wineries rarely offer more than one or two bottlings per vintage, American wineries frequently offer numerous products every year—some red, some white. The chain restaurants that dominate the American suburban landscape seem to live in corporate fear that they’ll lose business if the burger joint doesn’t offer a rib sandwich and salad, too. On foreign shores, it’s that notion itself that’s foreign. A mariscos stand would never offer carne asada. A Japanese ramen house would not likely put sushi on the menu. The rest of the world, as Anthony Bourdain has observed, sees virtue in doing one thing very well. And that’s where Phở Hòa (4717 El Cajon Blvd. in City Heights) comes in. Phở, for the uninitiated, is Vietnamese beef noodle soup (though chicken versions are not unusual). 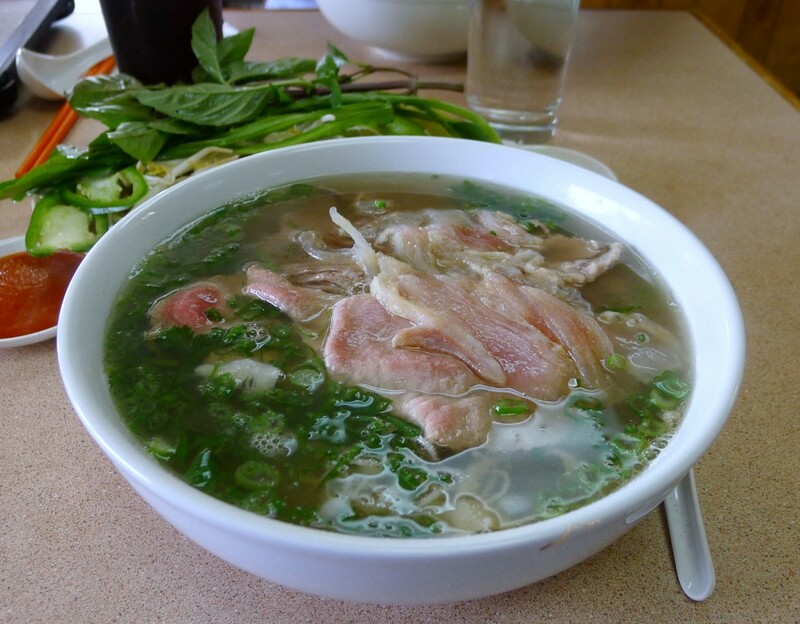 There are generally four moving parts to a bowl of phở: the broth, the noodles, the meat and the garnishes (bean sprouts, basil, cilantro, lime and chile peppers are common). I order the mixed phở, featuring lean and fatty cuts, tripe, tendons and sometimes balls of ground beef. It often shows up on menus, as it did at Phở Hòa, as phở đặc biệt (“special phở”). The most important part of phở is the rice noodles. It can be phở without beef, but it can’t be phở without noodles. And the noodles at Phở Hòa are exceptional. Rich and tender, they take on the essence of the broth but also bring their own flavor. Where the noodles in some phở are tasteless starch and at the worst have a stale quality, the noodles at Phở Hòa were delicious in their own right. The broth, a dark and mysterious concoction, was also excellent. Where many phở joints use soup cubes and MSG, there was none of that in this broth. It had a richness that spoke of beef bones and oxtails, charred onions and roasted ginger, as well as exotic spices such as cinnamon, star anise, cardamom and coriander. The meat in the soup was tasty, too. The lean cuts were lean, and the fat in the brisket was not—as is often the case—boiled to rubber. It’s the offal, though, that really shines: The tripe is toothsome; the tendon has that buttery consistency of perfection. Every cut was flavorful, asking only a brief dip in the sriracha sauce.